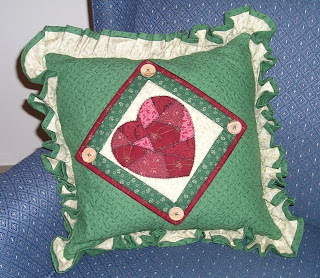 February's panel for my pillow features a patchwork heart. Both of my sisters love to quilt and to piece fabric together; however, I did not inherit that gene. I have managed to make a few quilts, but it is not a passion of mine. I admire the quilts others make and appreciate the time and skill it takes to create them. I prefer to spend my time knitting. 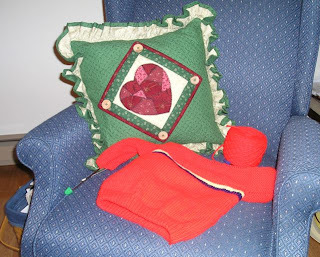 My current project is another Guidepost sweater, a red one for February. and the other is being sent to Rad Bad Beaniesin California. Another package is going to Cooper Hospital in New Jersey. 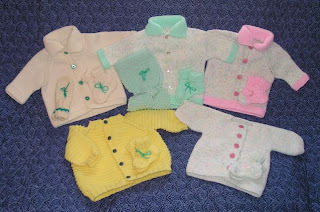 I am working ahead for the All Crafts for Charity's September project - Guidepost sweaters. It was the first time that I used the pattern, and I made some adjustments to accommodate my aversion to seaming. I knit the entire sweater without seaming by starting at the bottom on circular needles. When I reached the arms, I switched to two circular needles. I cast on the required stitches to the body on one needle and knit about an inch. Then using the other needle, I attached another ball of yarn and picked up the required stitches from the cast-on edge of the sleeve on the other needle. I then knit the sleeves on the two separate needles until the required length was reached. I finished the sweater with a three needle bind-off from opposite ends. When I reached the point for the neck opening, I did a traditional two needle bind off. 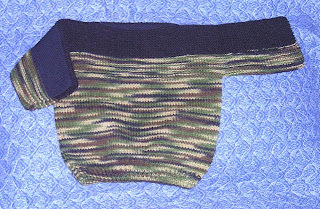 Ends were woven in and the sweater was finished without doing any seaming at all. I have started another sweater and hope to make several more before September. 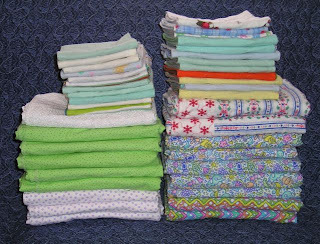 I decided it was time to find the bottom of the storage bins, so this week, I made receiving blankets and burp cloths from my stash. The blankets are easy to make with flannel on one side and cotton on the other and the corners rounded. Right sides are sewn together with a small opening and then turned right side out. The edge is pressed, and then I blanket stitch with my machine around the edge. The two sides are secured by stitching an "X" from one corner to the other. 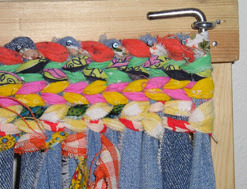 The burp cloths were made from scraps. Some of the burp cloths are probably too narrow, but I am sure that new moms will find them useful anyway. This batch was taken to Abba's House, a local pregnancy center. I buy the fabric from the remnant bin or when it is drastically reduced ($1 a yard). I also purchase flannel sheet sets during spring clearance sales. The sheets and pillow cases provide a lot of yardage. The Community Outreach office at the local community college approached me to teach a rug-twining class this spring. I have been making the rugs for many years and use numerous ones in my home. 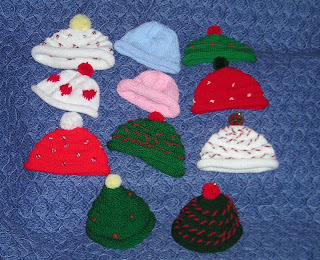 I have made them as gifts for friends and family. It is a fairly simple process, not braiding or weaving, but using two strands of fabric and twisting (twining them around the warp). It produces a strong and sturdy rug. I don't "plan" the rug. I pick the colors that I want to use and then reach into the basket and grab them randomly. I think it makes a pretty rug. 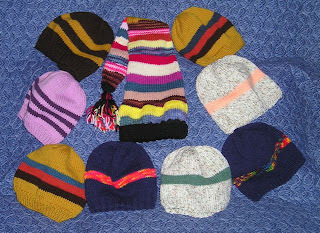 I have made some that have definite stripes, but I don't like them as much. I work on both end of the frame and meet somewhere in the middle of the rug. I think it helps keep the rug's tension on the frame equal, and it is more motivating. 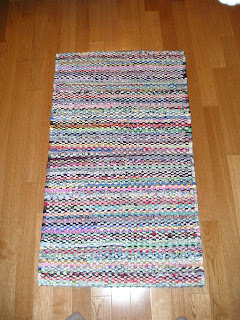 It would be terribly difficult to end the rug at one end because the last rows are very tight and awkward to finish. 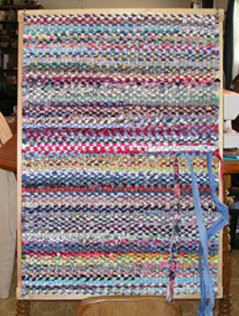 Once the rug is completed, the side rods are pulled out so the rug can be removed from the frame. 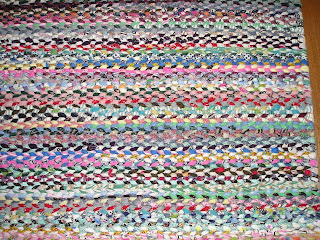 My mother used to make the rugs, and they were abused in the porch of our farmhouse. The rugs wear like iron and lay flat. These rugs are the ultimate in recycling: I use old sheets and clothes for the weave fabric and use blue jeans for the warp, so the rugs are not expensive to make. They just take a lot of time. I can usually make one in a week, but I have been known to finish one in three days. I don't advise doing that, as it can and will cause blisters on the finger tips. The items are packed and ready to be mailed to the Baby Pack coordinator tomorrow. 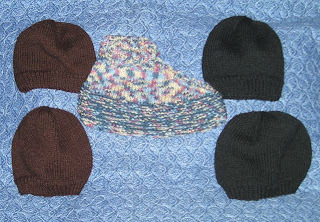 I posted a photo of the sweaters before, but now they have accompanying socks and/or hats. 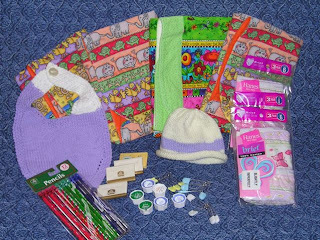 It was a lot of fun making the items for this charity. Knitting the sweaters was addictive: I couldn't stop at just one. I will definitely be knitting more sweaters for the three patterns that I used. The tiny socks were easy to make. I used Super Quick Baby Socks by DilysSutherland. The socks are knit cuff down and have a square-turned heel. I am sure that a baby would not be able to kick it off very easily. It warms my heart to know that my humble efforts will be helping children halfway around the world. It adds meaning to the line from an old song, "Let there be Peace on Earth, and let it begin with me." Will you join me in creating this Peace by making something for a charity, local or international? Here's a chance to voice your opinion. 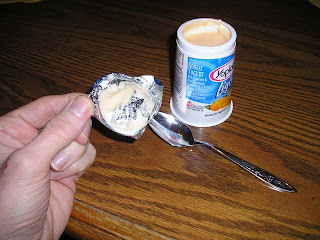 Before you is a yogurt container with a lid covered with the creamy delight. What do you do? e). are you kidding! I don't eat yogurt. 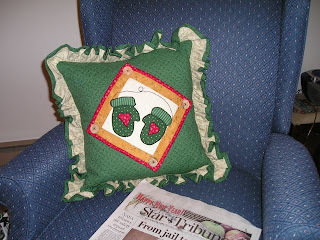 The pillow made its debut under my 2006 Christmas tree. The gift from my sister included an over-stuffed pillow, four interchangeable panels (December, January, February, March), and a promise to provide the other eight panels. The months sped on without additional pillow panels: Summer flowed into Fall and these months and seasons were represented by the plain back of the March panel. I didn't remind my sister of her promise to make the other panels because she was distracted with her grandchildren and her other sewing projects. I was happy to have the pillow and the four panels that she made. Fast forward to Christmas 2007 - I nearly squealed with delight when I opened her gift on Christmas day. Tucked in the box were the eight pillow panels! 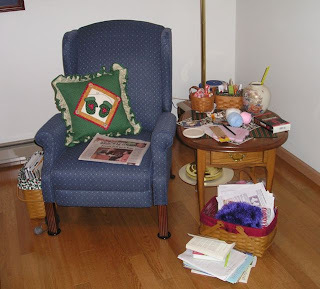 In the coming year, each month will show a photo of the pillow in my favorite knitting chair.